Here comes a big opportunity for the aspiring lyricists to make a big embarkation into the film industry. Jyotika starrer Kaatrin Mozhi team offers a great opportunity for the talented lyricists to give their best spell. The interested ones have to write lyrics for a particular song involving a theme given by the makers. The situation goes this way where an affectionate home maker, who had dedicated her life to the wellbeing of her family sets out to find her dreams and accomplish it. The song should reflect the good wishes of her husband and at the same time, the desolated feel within himself. The tunes will be given and the lyrics should be written accordingly. The best couple of lyrics would be chosen and the lyricists will be honoured during the audio launch apart from being offered with their due remuneration as well. The same occasion of audio launch will have the same song screened with the lyrics penned by Madan Karky, who will be selecting the best couple of lyricists as well. 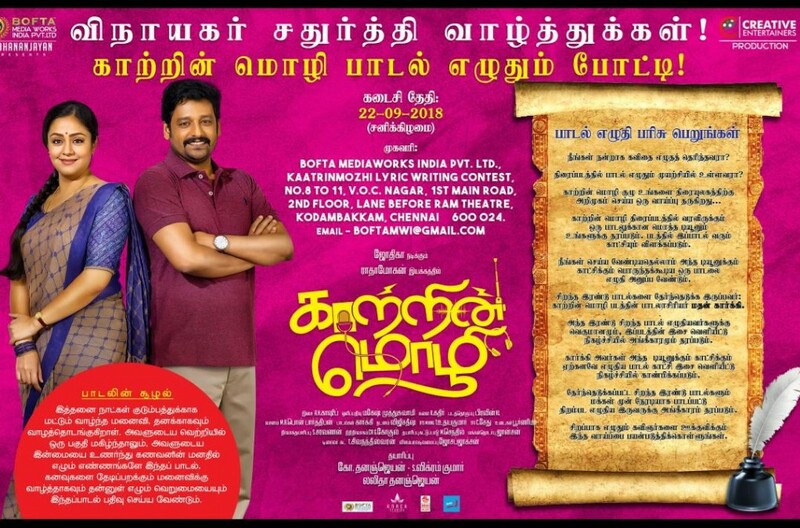 Kaatrin Mozhi is directed by Radha Mohan and is produced by G.Dhananjayan, S.Vikram Kumar and Latha Dhananjayan. The last date to submit the lyrics is (22-09-2018) Saturday at the address "BOFTA Media works India Pvt.Ltd. Kaatrin Mozhi lyric writing contest, No.8 to 11, VOC Nagar, 1st main road, 2nd floor, Lane before Ram theatre, Kodambakkam, Chennai - 600024. Email: [email protected]"
Kaatrin Mozhi is scheduled for release on October 18 for the festive occasion of Aayutha Pooja.